If you've committed to making healthy choices this year, but don't want to completely deprive yourself of all things sweet and gooey, we've got just the right dessert for you! Paleo-friendly, gluten-free and refined-sugar free, this chocolate cake is rich and has a mild hint of coconut. Naturally sweetened with dates and maple sugar, it's the perfect decadent treat for those whotry to avoid white sugar. 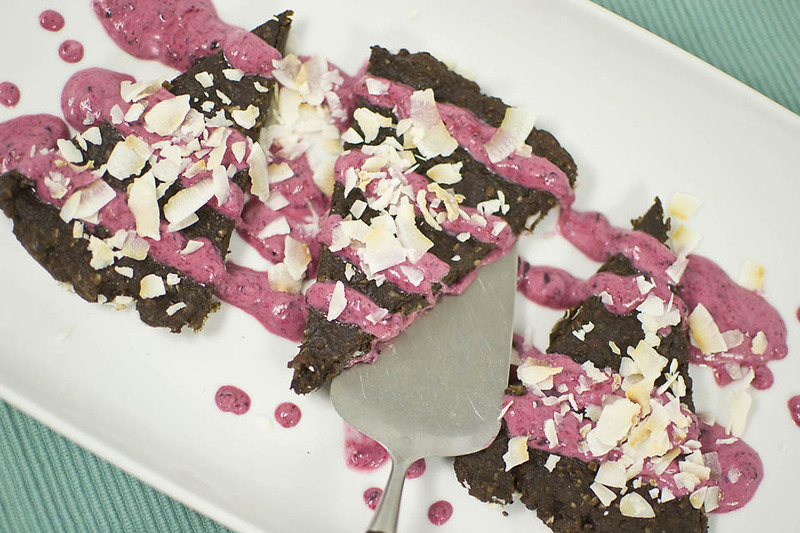 The almond flour adds a nutty texture and the cacao nibs make for a pleasant crunch. Serve it with a scoop of vanilla ice cream and a raspberry cream sauce for a fruity and slightly tart contrast to the chocolate. Run the Delicious Dates, Ch'almost Chocolate Cacao Nibs and shredded coconut finely in a blender until finely chopped. Transfer to a large bowl and combine with the cocoa powder, Soft-Ground Almond Flour, baking powder, vanilla extract and salt. Melt the Organic Love Coconut Oil and mix with the eggs and honey. Combine the coconut oil mix with the rest of the ingredients and stir until smooth. Grease a round springform pan (approx. 20-25 cm in diameter) with coconut oil and sprinkle the bottom and sides with shredded coconut. Pour the mixture in the pan and bake at 350C for approx. 8 min. Resist the temptation to keep the cake in the oven longer than recommended - the middle should still be gooey! Garnish with Precious Coconut. While the cake is baking, whip the cream until it's firm. If the raspberries are frozen, thaw them gently in a small saucepan. Mix the raspberries with a stick blender, then combine them with the whipping cream and maple syrup. Serve with the cake right away, or place in the fridge for an hour for a more firm texture. Enjoy!